2017 update: you may also want to also check out our post about the best work-appropriate nail polish colors. 1. Look for a nail salon where you won’t be visible from the sidewalk. Sure, you’re entitled to a lunch hour — everyone understands that! — but it’s an entirely different thing for your boss (or worse, a subordinate you’ve just dumped a load of work onto) to realize you’re spending your free time primping and pampering. 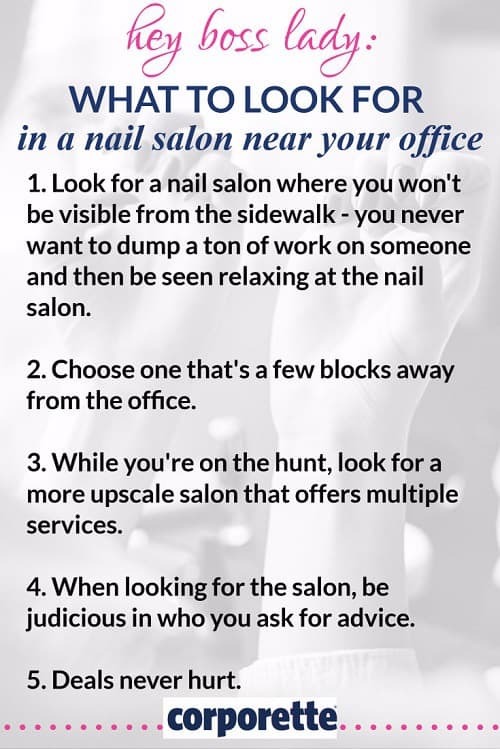 Look for a nail salon where the stations are set far away from the streetfront windows, or else aim for one on the second floor. 2. Choose one that’s a few blocks away from the office. It’s just better form — again, you don’t want to run into anyone from the office. 3. While you’re on the hunt, look for a more upscale salon that does full-hour massages and other salon-type things (instead of one that just does nails and 10-minutes massages). If you get one of those horrible kinks in your neck and desperately need to get a 30-minute neck rub, you’ll know exactly where to go. Same thing if you’re suddenly in need of an eyebrow shaping or something like that. 5. Specials never hurt. If you’ve found multiple places that meet all of the above criteria, your first choice should be one that offers specials — perhaps manicure and pedicure for one low price, or perhaps they participate in a spa week, or perhaps they use punch cards so if you’ve been enough times you can get 10 percent off… but the other criteria are way more important than this one (particularly since it will not be your main salon anyway). Social media image (background) via Pixabay.